Increase your Get New Art Alerts followers. "MyInformedCollector" New Art Alerts was first rolled out on our BoldBrush Painting Competition. We now offer "MyInformedCollector" New Art Alerts on all 3rd generation templates (see screenshots below). 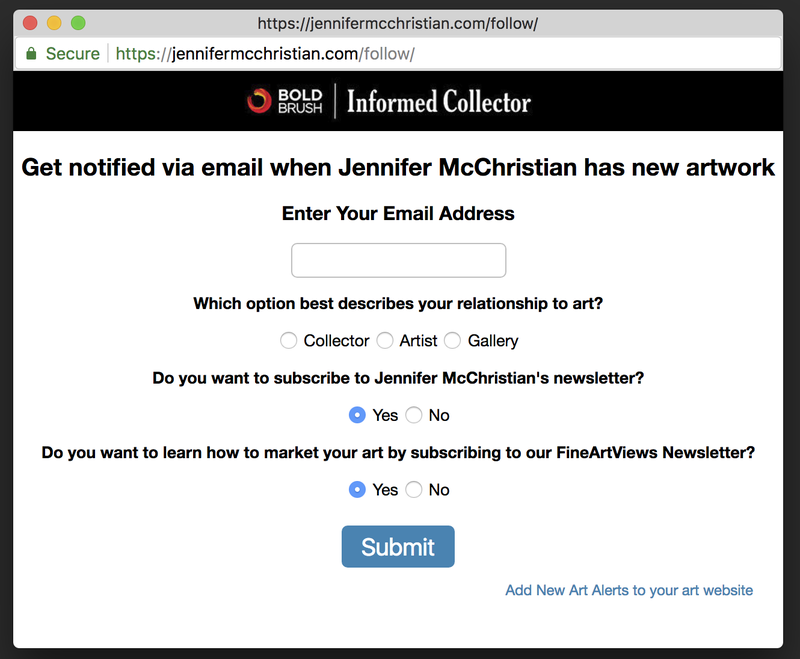 This exciting feature allows a collector to sign up to follow (via email) any FASO artist and get automated alerts when that artist posts new artwork. 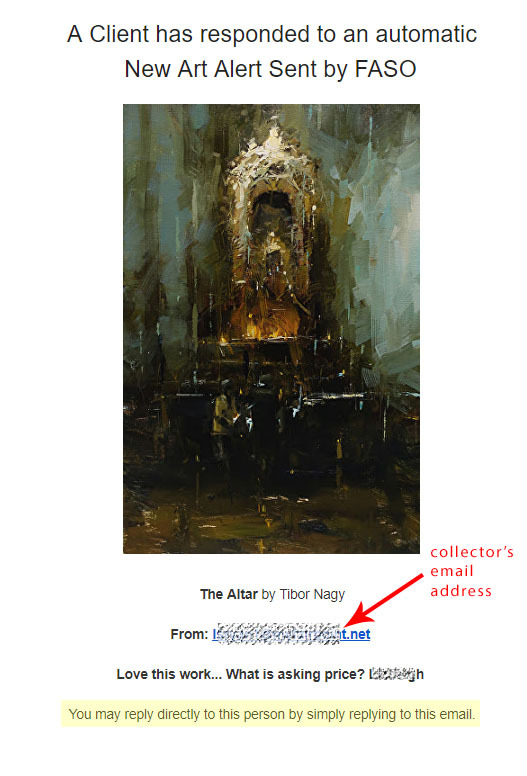 NOTE: When an artist uploads new art images in a batch upload (uploading multiple images in one fell swoop), only one New Art Alerts email is sent to the collector. The New Art Alerts email includes all of the images that were uploaded in that day. Here is a screenshot of what the button looks like on a BoldBrush contest entry. Get New Art alerts are automatic newsletters that are sent every time you post (upload) new art to your website. They work great especially if you post new art regularly, since they don't require the time and effort of more traditional newsletters. Increase your 'Get New Art Alerts' followers. 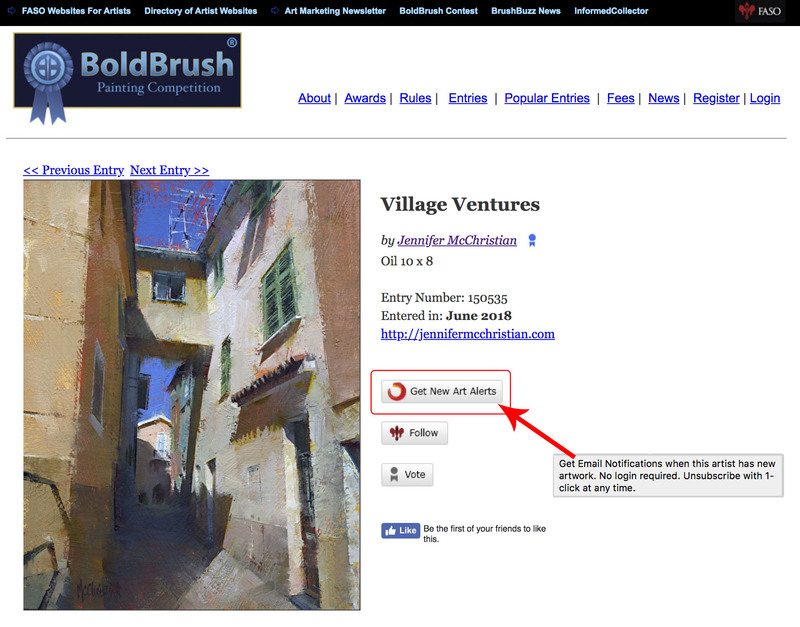 Enter the BoldBrush Competition - there's a Get New Art Alerts button next to each entry. Ask people to vote for your BoldBrush contest entries. 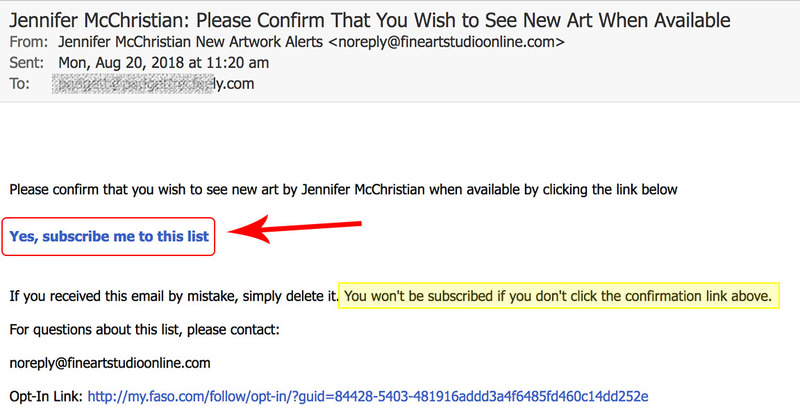 When they do, they can sign up to Get New Art Alerts with 1 click (super effective). Encourage folks to sign up for new art alerts on your social media channels. 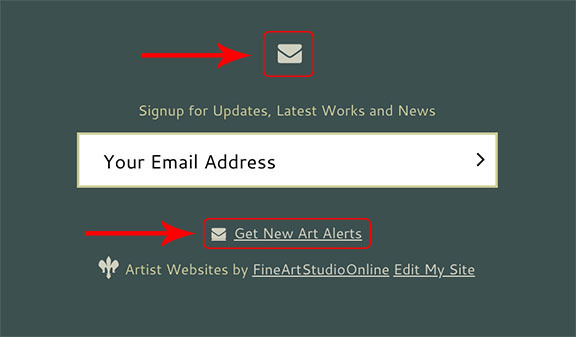 You will see the Get New Art Alerts icon (small closed-envelope) at the top or bottom of your website, depending upon your chosen template. 1. 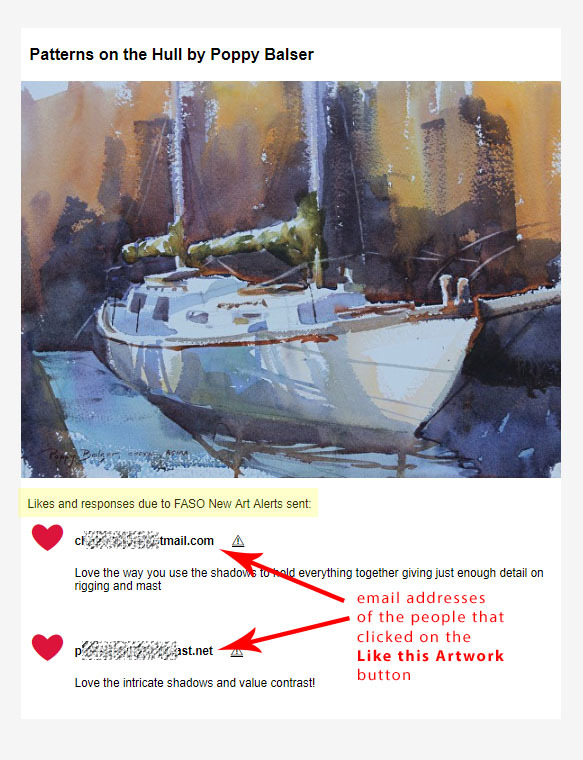 Example of a report an artist gets of all the people who clicked "Like this Artwork" on a particular artwork from the Get New Art Alert email, along with their email address and comments. This report is aggregated and sent daily. 2. Example of a "Purchase Inquiry". If a user makes a purchase inquiry, it is sent to the artist immediately, along with the user's email address and question, which is usually, "what's the price?" or "Is it available?" You do not get notified when someone signs up to receive New Art Alerts. You do get name and contact info when a potential collector chooses to RESPOND to an alert. The fact someone may choose to remain anonymous until they are ready to respond actually encourages more people to sign up for these alerts. The New Art Alert subscriber info will never be made public since it allows for anonymity for the subscriber. 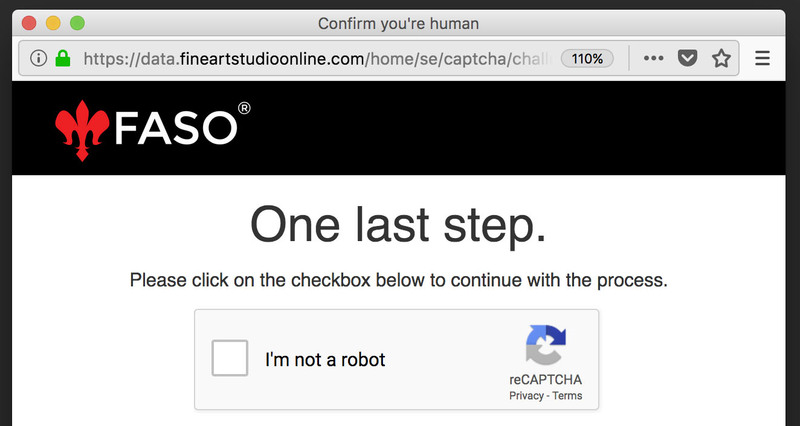 Art Alert emails are sent by FASO using our "no reply" email address. The "no reply" email address doesn't accept incoming email and thus it won't notify the artist in any way. If someone replies to an Art Alert email, you will not receive the reply. NOTE: This only prevents new subscribers. Notices will still be sent to any current followers.